Last Saturday Rob and I took another trip with Authentic Canadian Tours, a return trip to Amherst Island. Though we didn't see as many owls as we did on our first visit there, we had another fun-filled day with a great group of like minded people. We each had a "Lifer", saw a couple Snowy Owls, lots of Harriers and Hawks, and got to hand feed some hungry Chickadees. Stopping at the Big Apple on the return trip was a great way to end the day. This visit we stopped at Topsy Farms where gorgeous, traditionally made wool products are available for purchase in a cute little shed or you can order products online. Their herd of sheep is over 1200! A couple of the sheep enjoying the mild winter day. 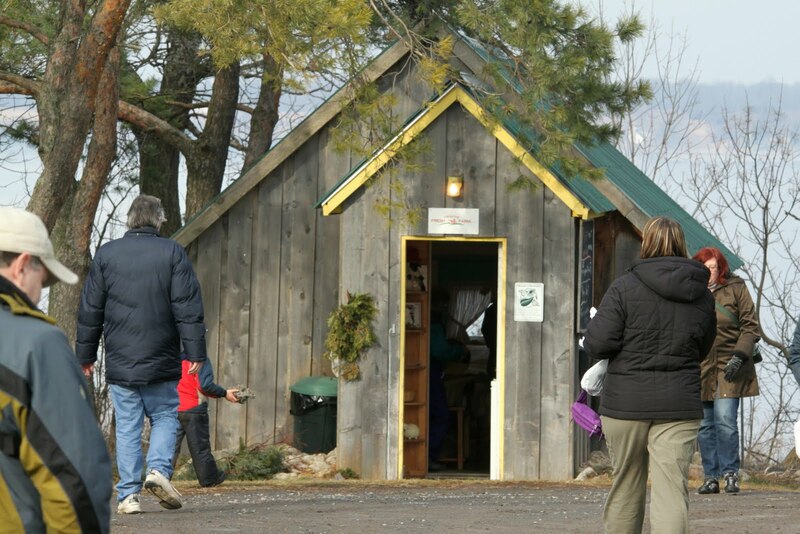 The "Wool Shed", where traditionally made wool products such as hats, blankets, mittens, and yarn can be purchased at great prices. Next time I go back I'm buying a blanket! I bought a pair of mittens for me and "Texting Mittens" for Rob, I thought they'd be good for photography. The mittens are lined with unprocessed wool so they aren't itchy! 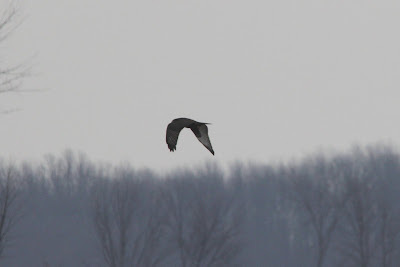 We had some good views of a Rough-legged Hawk, a lifer for Rob and I. I liked Rob's picture of him flying away. 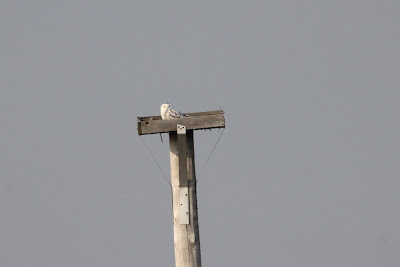 Our first Snowy of the day was sitting in an unoccupied Osprey nest far off in a farmers field. They usually don't perch so high, guess she liked the view. Our second Snowy was a lot closer. What a big beautiful girl she was! 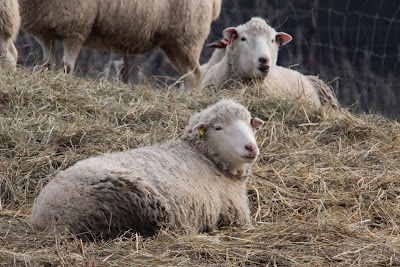 HI Angie - Thanks for your kind words about Topsy Farms Wool Shed. We enjoy Murray's visitors a lot. I'm glad you found your birds - great pics. The Shed picture shows my grandson's arm, with a tiny bird's nest he'd just found, all lined with our cull wool. Anyone interested in our stories is welcome to visit http://topsyfarms.wordpress.com/. I do hope you'll visit again - and that meantime your hands will stay warm. 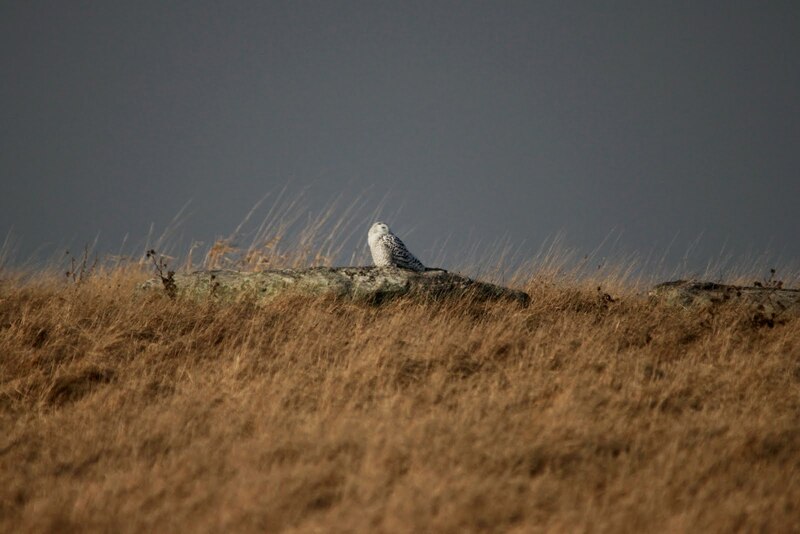 Nice write-up and photos Angie! It reads as another successful outing.